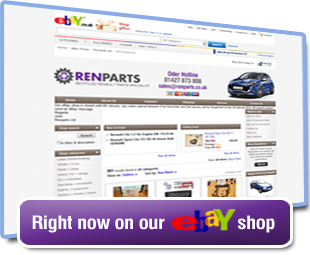 ﻿ Renault used parts - Ren Parts, Doncaster. As a seller of recycled parts, we want to be sure of not only value for money, but the quality of our parts, we are friendly and approachable, but are legally obliged to provide the following terms and conditions. i) The terms and conditions apply to all business transactions carried out by Renparts Ltd, hereinafter referred to as the 'Company'. 2. We will always try to supply the exact part that the customer requires. Due to the variations in make, model, design and year of manufacture, we cannot give any guarantee that all parts are correct or fit for the purpose required. It will help if customers can bring a sample part or provide a detailed picture for comparison, but all sales are made on the strict understanding that the customer is responsible for making sure that parts bought are correct or fit for the purpose required. In the event of a part purchased is not correct for the particular vehicle, we will attempt to replace the part with the correct one, provided that within 48 hours, the part is returned or notification is given of the customers intention to return the part. Please note that we shall not be under any obligation to replace any parts returned to us under these circumstances or to give any refund in respect thereof. A. The article offered for sale has been removed from the donor vehicle, tested and inspected and found to be of such quality as to carry an unconditional guarantee of straight exchange of money back should a replacement unit not be available, if the article should be found to be faulty or unserviceable. (The maximum period of guarantee for this category is 30 days). a. any fault or defect in parts arising from wilful damage, negligence, failure to follow their instructions (whether written or oral), misuse or alteration to parts carried out otherwise than by Renparts Ltd's employee's. b. any fault or damage caused by the fitting of parts otherwise than by Renparts Ltd's employee's. 16. If any term, provision, covenant or condition of this agreement is held by a court of competent jurisdiction to be invalid, void or unenforceable, the remaining provisions of this agreement shall remain in full force and effect and shall not be affected, impaired or invalidated. 17. Displayed postage amounts are for mainland uk only, the highlands, channel islands and Northern Ireland require an additional amount. Please enquire with the full delivery address for an indvidual quote.